The Regrettes. Warner Bros. Records. Punk is alive and well. At least if The Regrettes have anything to say about it. The LA-based four-piece played a brief though powerful set on June 30 at, of all places, The Che Cafe Collective on UC San Diego’s campus. The all-ages show was sold out, but that isn’t saying much given the size of the venue, a sweltering box containing about 75 people and virtually no air circulation. But this didn’t seem to faze the young moshers up front or the over-21s positioning themselves as close to the exits as possible. Frontwoman/rhythm guitarist Lydia Night, 17, informed the crowd that this was the last gig of their six-week tour. The singer suggested it’s been a long haul, but admitted feeling a bit “emo” about it coming to a close. With pink, blonde and brunette hair and tiny, black, heart-shaped tears on her cheeks, Night displayed equal parts teeny-bopper cuteness and a devil-may-care vibe. The emerging buzz band — rounded out by Genessa Gariano on lead guitar, Sage Nicole on bass and Drew Thomsen on drums — played a number of songs from their 2017 Warner Bros. debut, Feel Your Feelings Fool!, including “I Don’t Like You” and “Seashore,” which riled the crowd into a sing-along to the off-color lyrics. They also played their latest single, “Come Through,” from the two-song EP Attention Seeker released earlier this year. It’s a blissful dis that’s set to crunchy guitars and a catchy groove. To keep those over 21 interested, The Regrettes offered a couple of covers, including “Ballroom Blitz” from The Sweet and their set-closing version of Billy Idol’s “Dancing with Myself,” for which members from the two opening bands — Destroy Boys and Mt. Eddy — were welcomed to join them on stage. It wasn’t perfectly executed but it was delivered with a lot of energy and everybody on stage looked to be immersed in the moment. And isn’t that what punk music is all about? Speaking of Mt. Eddy, this reviewer owes them an apology. Unfamiliar with their origins, during their set I was mentally docking the band points for sounding too much like Green Day. The lead singer sounded like a spot-on Billie Joe so I chalked it up to derivativeness — a la Greta Van Fleet of Led Zeppelin. It was only until after the show that I learned the 18-year-old vocalist is actually Armstrong’s son. Taking this error into consideration, there’s something that can be said about all three bands on this bill: They are fresh and exciting and suggest that punk-pop is not only alive, but it has a promising future…something that would no doubt yield pride from today’s veteran torchbearers. 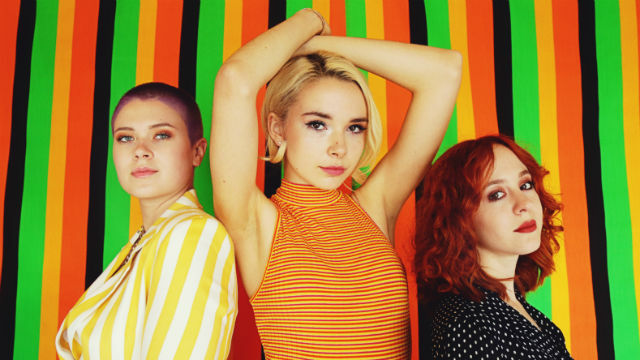 In addition to their headlining summer tour, The Regrettes have played numerous music festivals this year, including Summerfest and Riot Fest, and they’ll return to San Diego on Aug. 11 for a spot on 91X’s X-Fest lineup, which also includes Beck, Death Cab For Cutie, and The Strokes. For the past 30 years, Donovan Roche has covered the world of music — from the release of Nirvana’s “Nevermind” to Prince’s unpronounceable name change to the return of David Byrne.